A step above the previous Workforce model, the Epson AL-MX200DWF monochrome printer offers a WiFi connection, in addition to other key benefits like mobile printing, networking, and fast 30 ppm printing. The device is built for demanding work environments, offering impressive print rates, without compromising print quality. The Epson AL-MX200DWF even offers direct to USB functions, for even more convenient use. However, the unit still does not offer colour production and scanning can be quite slow. 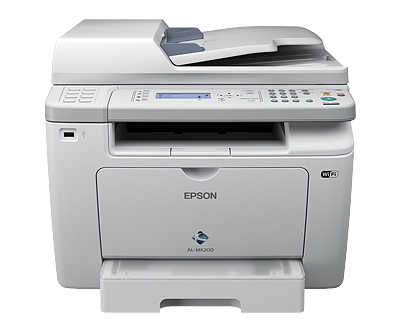 The Epson AL-MX200DWF has a typical design configuration. It features an automatic document feeder and a flatbed scanner, a duplex unit, Ethernet interface, and an additional USB port for direct scanning and printing. The device accommodates different kinds of print media up to A4 in size, and it features built-in WiFi, in addition to iPrint support. The built in Wi-Fi receiver is the main advantage of the Epson AL-MX200DWF. It allows users to print wirelessly from compatible devices. The Epson AL-MX200DWF also offers wired networking and it uses high capacity cartridges that are easy to install and replace. The device can do 30 ppm printing and its automatic duplex allows for simple dual-sided printing. On the other hand, the Epson AL-MX200DWF does not offer colour production. Otherwise, this unit is an excellent addition to offices with demanding print needs as well as for home users who prefer wireless printing, with the added benefit of quality scanning, fast printing, copying, and faxing.